When engineers or designers want to test the aerodynamic properties of the newly designed shape of a car, airplane, or other object, they would normally model the flow of air around the object by having a computer solve a complex set of equations–a procedure that usually takes hours or even an entire day. Nobuyuki Umetani from Autodesk research (now at the University of Tokyo) and Bernd Bickel from the Institute of Science and Technology Austria (IST Austria) have now significantly sped up this process, making streamlines and parameters available in real-time. Their method, which is the first to use machine learning to model flow around continuously editable 3D objects, will be presented at this year's prestigious SIGGRAPH conference in Vancouver, where IST Austria researchers are involved in a total of five presentations. Machine learning can make extremely time-consuming methods a lot faster. 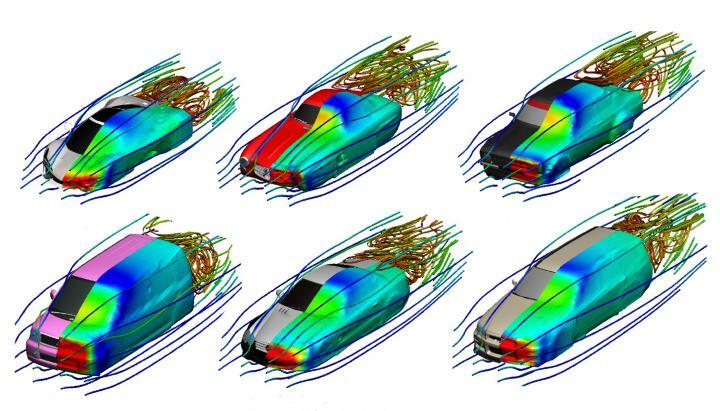 Before, the computation of the aerodynamic properties of cars usually took a day. "With our machine learning tool we are able to predict the flow in fractions of a second," says Nobuyuki Umetani. The idea to use machine learning came up in a discussion between the two long-time collaborators. "We both share the vision of making simulations faster," explains IST Austria Professor Bernd Bickel. "We want people to be able to design objects interactively, and therefore we work together to develop data-driven methods," he adds. So far, it has been extremely challenging to apply machine learning to the problem of modeling flow fields around objects because of the restrictive requirements of the method. For machine learning, both the input and the output data need to be structured consistently. This structuring of information works well for 2D images, where a picture can be easily represented by a regular arrangement of pixels. But if a 3D object is represented by units that define its shape, such as a mesh of triangles, the arrangement of these units might change if the shape changes. Two objects that look very similar to a person might therefore appear very different to a computer, as they are represented by a different mesh, and the machine would therefore be unable to transfer the information about the one to the other. The solution came from Nobuyuki Umetani's idea to use so-called polycubes to make the shapes manageable for machine learning. This approach, which was originally developed to apply textures to objects in computer animations, has strict rules for representing the objects. A model starts with a small number of large cubes which are then refined and split up in smaller ones following a well-defined procedure. If represented in this way, objects with similar shapes will have a similar data structure that machine learning methods can handle and compare. The researchers also proved in their study that the machine learning method achieves an impressive accuracy, a prerequisite for engineering. Nobuyuki Umetani explains: "When simulations are made in the classical way, the results for each tested shape are eventually thrown away after the computation. This means that every new computation starts from scratch. With machine learning, we make use of the data from previous calculations, and if we repeat a calculation, the accuracy increases."